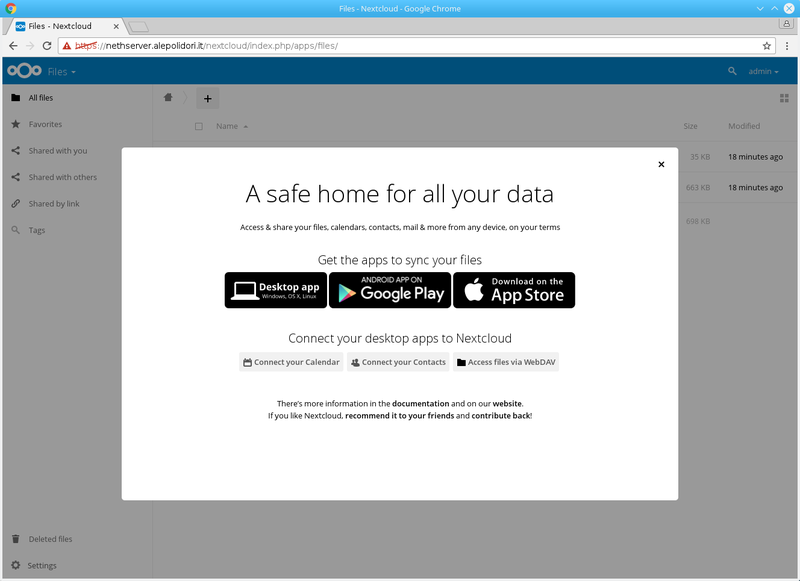 Nextcloud is a new open source project that makes a private cloud platform at your home. The objective is to give people back control over their data. As Frank Karlitschek (the founder) announced on 2 June 2016, it was born as a fork of the well-known OwnCloud project to reboot it in a better way. As OwnCloud, Nextcloud is a web application to store data in your own private machine in a centralized manner. The service is similar to Dropbox or Google Drive, but your personal data reside on your personal server under your control, not in someone else’s data center. Nextcloud permits to store your files, folders, contacts, photo galleries, calendars (or anything else) on a server of your choice protecting your privacy. Thanks to the web/mobile/desktop apps, you can access your data wherever you are, whenever you need it. Your data is always synchronized amongst your devices. One folder, two folders or more – get the most recent version of your files with the desktop and web client or mobile app of your choice, at any time. 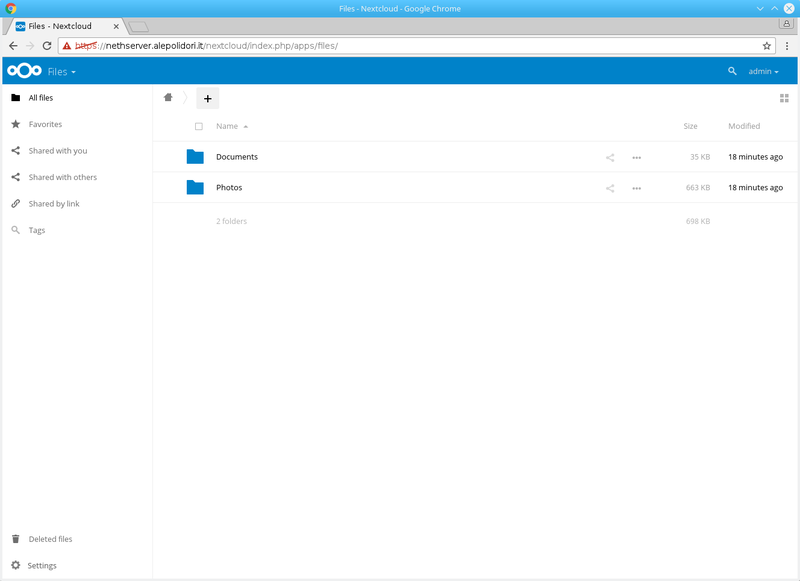 NethServer has switched to Nextcloud from version 7 and developers have built the software packages for the community to easy install and update the app. What are the differences with OwnCloud ? We love Nextcloud because it aims to significantly accelerate development, focusing on an open process with fewer blockers like Contributor License Agreement or closed enterprise app. It reduces barriers to contribution and increases transparency to enable more input of customers and users. This will provide the bug fixes and security hardening all users need in a very rapid manner. Nextcloud includes all the enterprise features of OwnCloud as a base installation, integrates a new WebRTC based communication platform with video conferencing and text chat, it has an improved his app store to facilitate developers to deploy new apps and have more and more functions. It has also improved the update process, the possibility to add multiple site federations and so on. It also offers Collabora, a LibreOffice-based online office which supports all major document, spreadsheet and presentation file formats to edit your file online. Installing and properly configuring Nextcloud requires some efforts: you need to install the web server, the database, the software and integrate all those parts together. And if you need to integrate it with your existing system user and groups ? Or configure daily incremental backups ? Or if you want to manage automatic update/upgrade to the latest version ? Using NethServer it is possible to have a Nextcloud 1-Click installation and automatic subsequent updates without any efforts. NethServer is a server Linux distribution which have the main goal to make sysadmin’s life easier with Open Source. NethServer helps sysadmins being successful in the IT space by leveraging all the power of a Linux server without complexity. It offers a simple and easy to use web interface, to install and configure all features of a server, from user creation to software installation. The installation remains the same of ownCloud with Nethserver 6: you can install it with 1-single click and start to use it immediately. 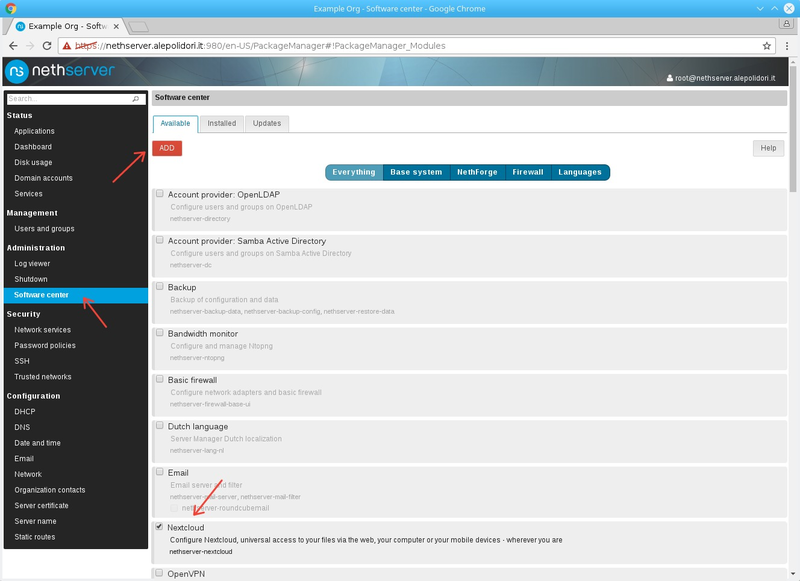 Install Nextcloud from Software center: point your browser to NethServer Software center and select Nextcloud from the list, then click ADD. 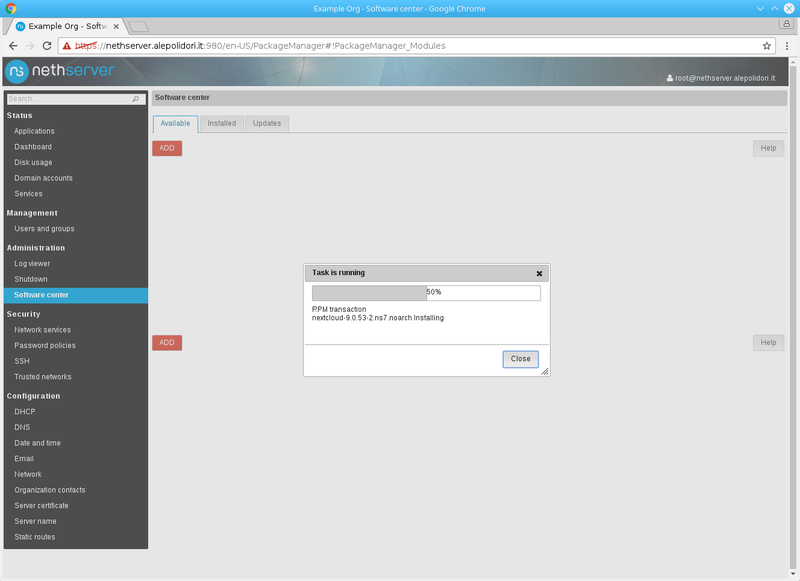 The package manager will download the latest Nextcloud version and install it. 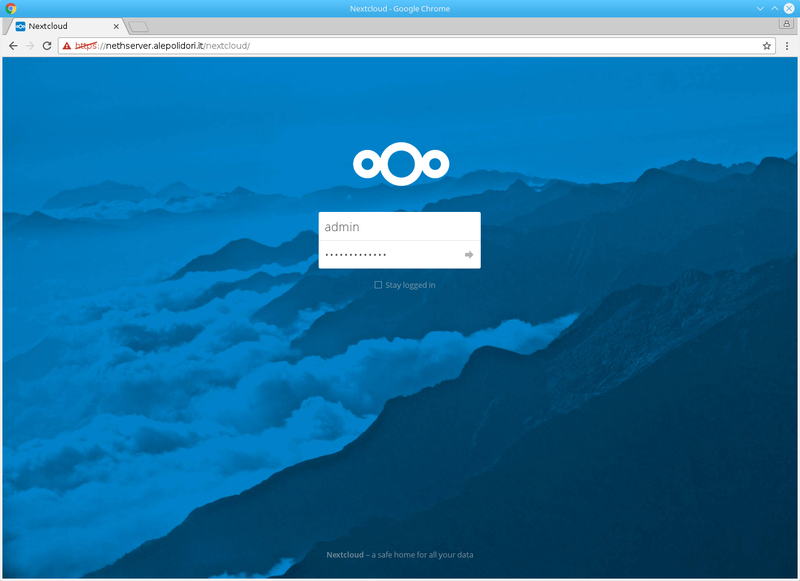 Once the installation is complete you can login to Nextcloud with your NethServer user account at https://your_server/nextcloud. You can always login as "admin" user. A new community has grown up with a number of participants always increasing that permit to have a great product. As Jos Poortvliet (the Nextcloud community manager) said in his blog: "Nextcloud is the future of open source file sync and share and it is the next generation of on-premise cloud technology." This new project is amazing and NethServer is the best choice to use it without any effort, easily and quickly. 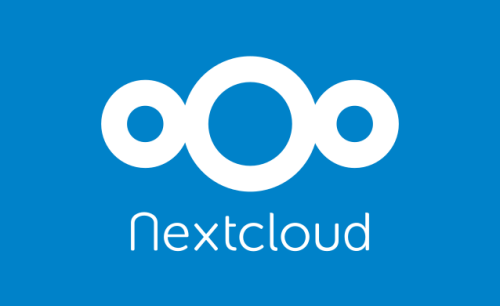 What are the differences between ownCloud/NextCloud?